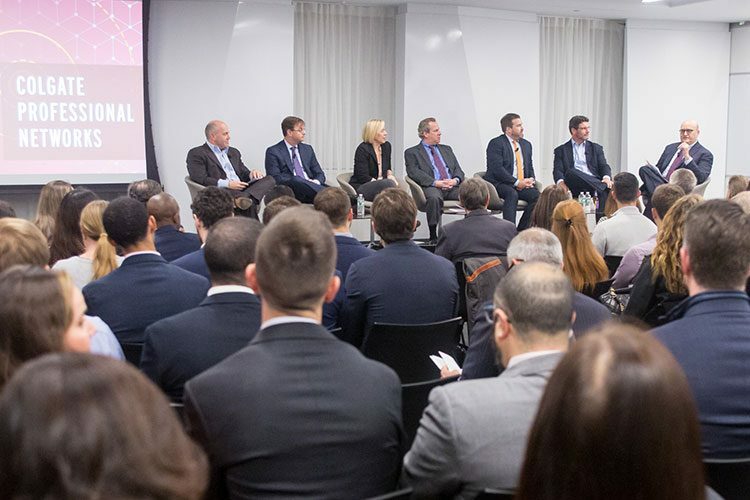 More than 200 Colgate alumni and friends joined the Colgate Real Estate Council and the Digital Business and Technology Network last month for a conversation on eCommerce and the changing face of retail sales. Panelists discussed the ways that the retail industry has changed in recent years. Although 85 percent of consumers continue to do the majority of their shopping in brick and mortar stores, eCommerce has begun to account for 10 percent of sales in the United States. Hendell said that the consumer is the driving force of the economy. Because consumers and consumer interactions are, in his words, “anything but stable,” the future of the industry is unstable, too. Because consumers in the United States often buy things out of want rather than need, retailers work to convince consumers that their products are worthy of being purchased. Retailers have readjusted their consumer experiences, hoping that the experience helps to sell their products. Panelists reached a consensus that the product and the experience are equally important. The product is the core of the retail experience, but the experience can affect the perception of the product. “Good real estate could not bail out a terrible merchant, and great merchants did a tremendous amount of business in some pretty mediocre real estate,” said Hurwitz. After panelists finished their discussion, Colgate’s Real Estate Club — tuned in from Hamilton, N.Y., via LiveStream — asked the first question of the night, and the conversation returned to the reimagining of brick and mortar sales, because many traditional retailers may cease to exist after attempting to refinance in the next few years. WalMart has used eCommerce to bring consumers back into the store. Costco has brought consumers into the store by offering short-term sales that may not be available the next time the consumer visits. Only time will be able to tell which of these various strategies will create the most convincing consumer experience. At the end of the panel, alumni took time to reflect on the ways that Colgate Professional Networks have affected their post-graduate experience — connecting alumni, students, and friends of the school to create enriching professional experiences. The Colgate Real Estate Council will host Colgate students for an immersion trip in January, allowing students to shadow professionals in real estate offices in New York City for multiple days.